For ski patrollers and others in the outdoor recreation community, the National Ski Patrol has developed Outdoor Emergency Care (OEC) – an award-winning program to educate, train, and credential rescuers who deal with outdoor emergency situations. The nationally recognized program helps rescuers to manage trauma and medical emergencies in all environments and is specifically tailored to that of a nonurban setting in which ambulatory care may be hours away or altogether nonexistent. 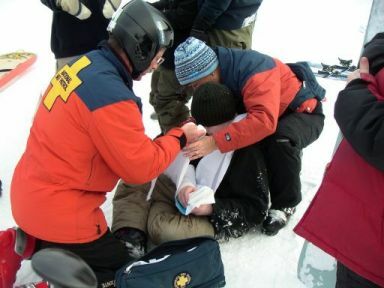 Originally developed in the 1980s, Outdoor Emergency Care has gradually evolved to meet the needs of other outdoor emergency care providers including river rafting and mountaineering guides, wilderness medical technicians, search and rescue groups, parks and recreation employees, and mountain bike patrols. Today, OEC is considered the gold standard of outdoor emergency care training and is recognized by recreational facilities and resorts in all 50 states and many parts of the world. For mastery of OEC objectives, candidates are required to devote 80 to 100 hours of class and study time for successful completion of written and practical testing scenarios. The OEC course is a competency-based educational program that prepares patrollers and other rescuers without previous first aid or EMT training to handle trauma or medical emergencies typically encountered in a nonurban setting. OEC skills are focused toward the wilderness environment, with special emphasis on ski and snowboard injuries, wilderness extrications, high-altitude illness, cold weather conditions, and specialized equipment for emergency care and transportation in challenging environments of the outdoors. OEC candidates are required to apply skills learned in class and to participate in comprehensive lessons involving medical care of the injured. They are also expected to complete OEC workbook exercises, to take a final written OEC exam, and to demonstrate knowledge and skills in scenarios mimicking actual situations. The OEC course is typically offered by ski patrols and starts in late summer in order to begin on-hill training in December. The on-hill portion of the OEC course tests skiing or snowboarding proficiency and assures proper evaluation, packaging, loading, and transport of the injured guest from the ski hill to the patrol room for additional evaluation or rapid relay to EMS personnel. In no other realm is continuing education more essential than in emergency care. OEC technicians must, therefore, attend OEC refreshers on an annual basis. This training reviews one-third of the OEC curriculum each year, thereby cycling through the entirety of the OEC course in three years. The OEC refresher is usually held in September in preparation for the upcoming ski season and in order to update competencies with equipment used for airway management, splinting, bandaging, immobilization, and traction. Additionally, all ski patrollers or rescuers are required to annually update BLS/CPR credentials and skills which include the use of AED equipment for cases of cardiac arrest.